Vest news - Friend Shirley visited today and was wearing her Northwest Sunset Vest. The colors are so beautiful and the vest fits her perfectly. I tried on my Whirligig vest and we both agreed that the armholes are too big. The vest is designed for a man and the width at the top of the shoulders is too wide. We think the only way to fix it is to rip down the armhole ribbing, decrease some stitches at the start of the armhole ribbing and re knit a much narrower ribbing. I think I can rip down to the pick up row for the ribbing and make it work. I must have known this was coming since I didn't weave in the yarn at the end of binding off the armhole. At least the vest body fits and looks good. Bet it is not going to be fun to rip out yarn that has been washed and dried. 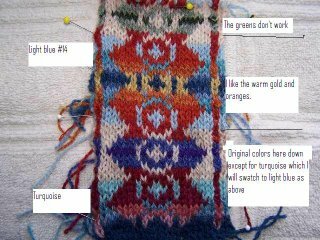 On the Shirt Tail Hemmed Cardigan front, I've swatched the colors from Ann Fietelson's design and then decided I want to change the colors. The colors when all the skeins are together are quite different from the color photo in the book. I'm not a real pinky person which includes purples. I've pulled colors and found that I can put together rusts/oranges/yellows and blues to look like a New England fall. I was trying to put in some greens where the purple perrie was but it didn't work as a continuation of the rusty main colors. Instead of the green, I've swatched now with a really neat brown tweed that has gold flecks in it along with a dark brown. 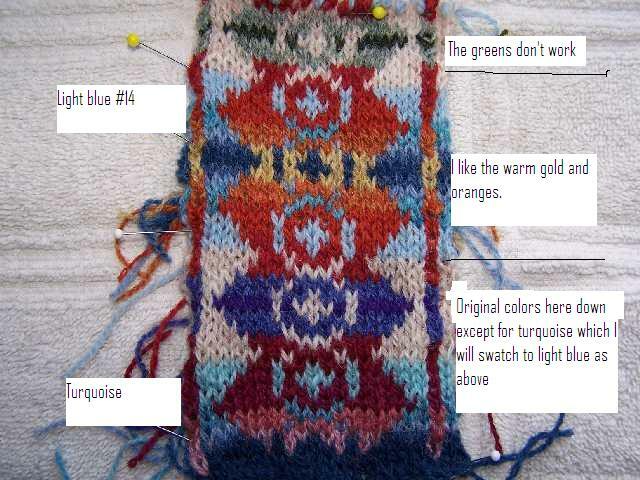 I must have been happy with the colors since I'm now up to row 5 on the design. Will post a photo once the design starts to show. I do need to get a new bag of stitch markers since what I'm using are all the left over really big ones. Need smaller ones for these size 3mm needles. New things learned - provisional cast on over a crochet needle and increasing for the shirt tail. Thankfully I practiced with about 20 stitches since the first two times I could not pull out the bottom row started with the crochet. It's a cool technique and one I will use for other work later. I'm truly tempted to knit up to above the shirt tail steeks an inch or two and then do the hemmed ribbing. I cannot imagine making that whole sweater and then having problems with the bottom rib. Rather rip out or abandon 3-4" than 30". As a break from 2 ply and size 3mm color work, I'm also taking part in the FLAK (Follow the Leader Aran Knit Along) at http://www.bigskyknitting.com/FLAK/knitalong.html. What a fun technique to knit from the top down around saddle shoulders. Of course I could not leave the design alone and am changing 3 horseshoe cables for a big Baroque Cable out of one of Barbara Walker's stitch books. It's being made out of Cascade 220 in a royal blue on size 5 needles. Feels like rope compared to 2 ply weight. The Heilo Norwegian Reindeer sweater is put aside for right now since it doesn't have a steek and I'm going to have to figure out a way to cut into the pattern evenly. Wish I had known steeks before I started that sweater because I would have added them. So much knitting, so little housework. Good thing hubby Joe likes to cook and is on the self feeding plan.